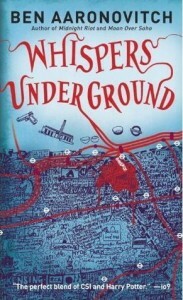 The first two books in Aaronovitch’s Fantasy/Detective novel series had both been entertaining stories as detective constable Peter Grant tried to adjust to his new role as apprentice to the Metropolitan Police’s lead investigator of supernatural crimes and the third book is another good entry in the series. This time Grant is investigating the murder of a young American student whose body was found on the tracks just outside Baker Street Underground Station. This initially seems to be a mundane, if mysterious crime, but Grant feels that magic was involved in the killing and his investigation will lead him to discover long-hidden secrets in the dark tunnels beneath London. He also has to deal with the parallel investigation by a FBI agent (the dead student having been the son of an American politician) who is adept at ignoring the technicalities of being outside her jurisdiction which leads to the additional complication of Grant having to investigate without letting her find out that he is the apprentice of one of Britain’s last magicians. There is also a parallel plot as Grant and his colleagues continue to investigate the mysterious and powerful magician who confronted them in the previous book in the series. There are a lot of things to like about this book. The characterisation is strong again, Peter is an entertaining narrator and a likeable protagonist and there’s some welcome character development for his colleague Leslie as she adjusts to her new role working alongside Peter in The Folly. Agent Reynolds is a good addition to the cast as well, although her initial introduction suggests that there might be a fairly clichéd clash of cultures between her and Peter they do make a reasonably good team after some initial misunderstandings. The exploration of the hidden depths of London’s underground is interesting, as is the continuation of Peter and Inspector Nightingale’s quest to track down the enigmatic Faceless Man, however one downside is that the actual murder investigation itself isn’t as interesting as the other elements. Although some of the subplots have good endings the actual resolution of the murder investigation is disappointing and manages to be simultaneously dull, rushed and implausible including the murder confessing to the crime in a way reminiscent of a bad TV murder mystery. It’s also a bit disappointing that we don’t end up learning much more about the Nightingale’s background or the history of the decline of magic in Britain, this was one of the more interesting parts of the previous book but there isn’t much extra information given here. This continues to be a good series, however like the previous novel “Moon Over Soho” is doesn’t feel as if it has quite realised its full potential either as a detective story or a fantasy story.